From time to time you can experience this error when you do search in TA RSA1. This happens because of inconsistency of between ABAP programs and DDIC elements. Usually solution is to regenerate such an programs. One of the options is to use ABAP report TOUCHTAB. See detail in note: 162991 - Generation tools for ABAP programs where also other tools are mentioned: e.g. reports: RSGENDUMP, RSREGEN, ZRSGESUB TAs: SAMT, SGEN, etc. There is a field in InfoObject maintenance screen tab Business Explorer ->System Alias for OBN. I was curious what is this field useful for. I was not able to find any specific documentation for this field. However it looks like field has a relation to Object-Based Navigation (OBN) scenario. 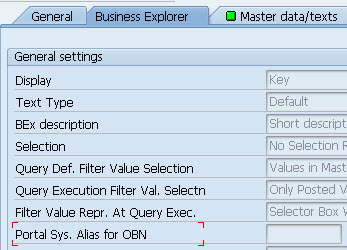 OBN functionality basically resides on SAP Portal. 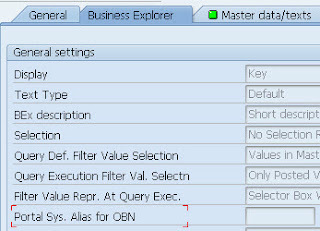 It is possible to do the navigation to object, returned by a business object operation that contains requested and relevant business information, according to the user role. As an example there is a source iView on SAP Portal for which OBN object operation is activated. Target of this navigation returned according user role by requesting information. In case target is InfoObject in BW system we need to maintain this system alias for OBN right away on this IO screen. For handling date/time characteristics in transformations there is a special rule time available: called Time Characteristics. What is TA to maintain fields of Datasource? This is quick tip on DataSource topic. From time to time we need to adjust settings of fields in datasource. Very common case (just to name one) is necessity to change some fields to be available for selection or set it as “Only Known in Exit”. CO-PA Accelerator is a one of HANA accelerators which are basically tools for speeding up of existing e.g. ECC’s functionalities leveraging SAP HANA. In particular case of this accelerator CO-PA’s operating concern data is transferred to HANA database. Reporting on CO-PA data then is on HANA’s in-memory DB rather than to classic ECC’s relational DB. CO-PA Accelerator comes with ECC’s version SAP ERP 6.0 SP21. Furthermore I detail customizing steps that are needed in order to enable integration of HANA with ECC’s CO-PA.